The cover-art of 2010 TooliKalam, the official magazine of Milonee, by Manick Sorcar. 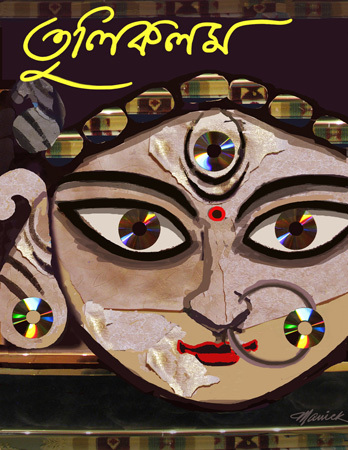 The unique cover-art for 2010 TooliKalam (The Brush and the Pen) magazine of Milonee (the Bengali association of Colorado) was designed by Manick Sorcar. It was adapted from his original artwork Trinayoni (The Tri-eyed, 54" x 42") crafted with torn pieces of wallpapers, spray-paint, acrylic, and CDs, which will be on display at the forthcoming art exhibition “Nostalgia” on September 25 and 26, 2010, 10 am to 6 pm, at the Sorcar Art Gallery, 14565 West 58th Place, Arvada, CO 80004, USA. By Hindu mythology, the tri-eyed Goddess Durga saved the earthlings and human beings from the evil hands of Mahishasur, the devil. She was empowered by Brahma, the creator of the universe – by giving her three eyes and ten hands to aid in the destruction of the devil. The cover-art of 2006 TooliKalam, by Manick Sorcar. 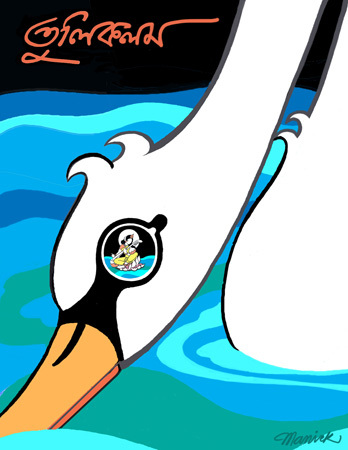 Earlier, Manick did the cover art for the 2006 issue of TooliKalam which had the portrait of Saraswati, the Goddess of music and education, seated on a lotus as seen in the reflection on the eye of her pet, a swan. Manick Sorcar is one of the founding-members of Milonee.